Dana Simmons “We are all Connected.” Photo by Laura Murphy. “Muliebrity” is coordinate term to “virility,” referring to qualities of femininity. 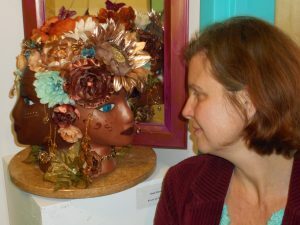 Southwestern College staff, faculty, and students were invited to explore how they connect with and empower the feminine aspects of the self, community, or greater collective via artistic processes. 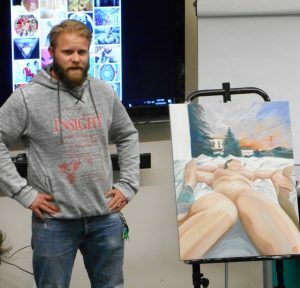 Eric Case presenting about his painting. Photo by Laura Murphy. 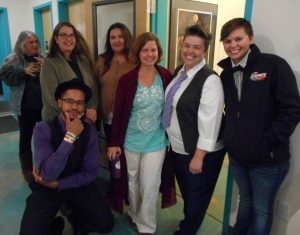 On Thursday, November 10, 2016, the Wild Heart Gallery hosted a night of artist presentations that included contributions from Dana Simmons, Lauren Roberts, Laura Murphy, Victoria Begay, Nancy Lemmon, Ann Filemyr, Jessica Brennan, Eric Case, William Jenkins, Michelle LeGrand, Connor Anderson, and LaTausha Cotner. 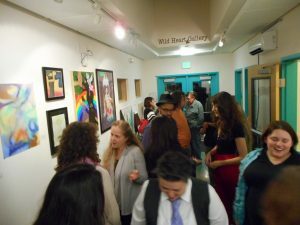 The verbal presentations ranged from formal artist statements to spoken word expression, weaving in and out of the gallery space until the audience members were free to converse amongst themselves and spend more time exploring the installation work. Muliebrity opening night gala. Photo by Laura Murphy. The gallery is filled with works from 22 students, of various media and visual content. This exhibition ran until the start of January 2017.